August 12, 2013 filipinocavedivers Cool Stuff! 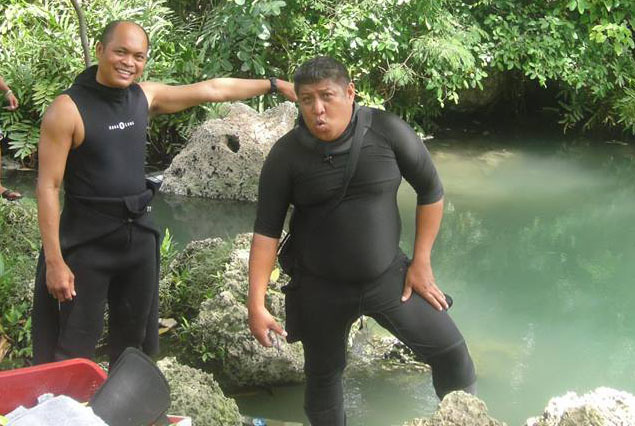 Jaime Lapac (NAUI OPW Instructor #17688) and Andy Berame (Advanced Nitrox, Lapu-Lapu City Environment and Natural Resources Office, member of CFARMC board), FCD’s first cave diving students at Pawod, Mactan Island. August 11, 2013 was a red-letter day for FCD. 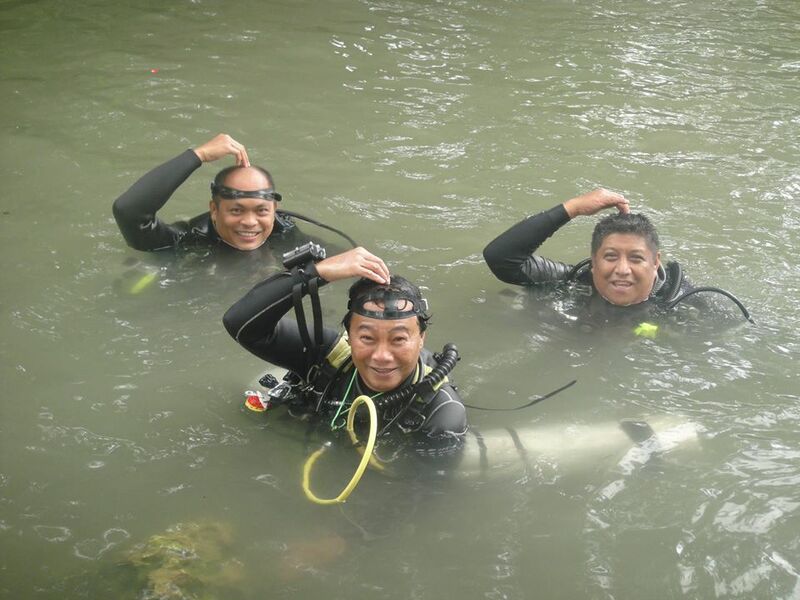 The pioneer cave class did their first cave dives at Pawod, Mactan Island. This was a familiarization dive for both since they have never been in a true overhead environment. 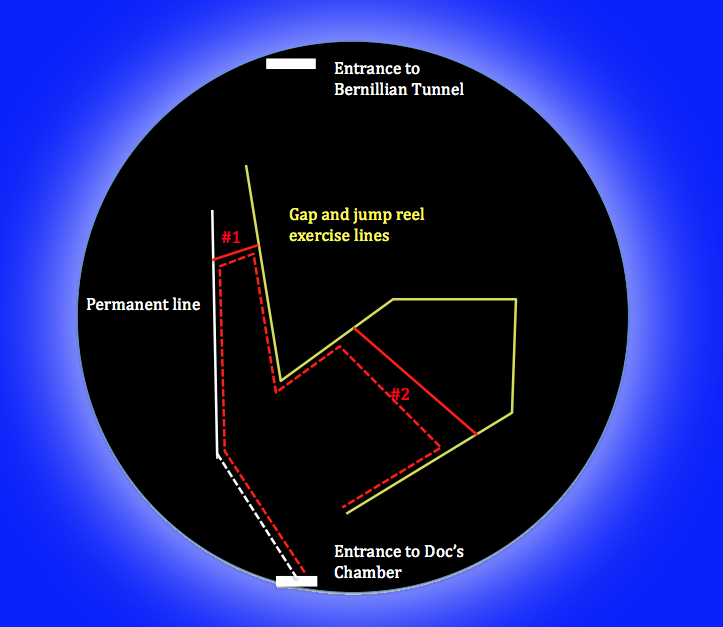 Diagram (c Doc Amores) of Doc’s Chamber at Pawod Underwater Cave System. Dotted red line marks the first ever cave run of the 2-man team of Andy and Jaime, doing line-following and line jump exercises (#1 and2). Due to poor visibility at the spring pool, Doc had to lay a temporary line out to open water (white dotted line). Typical of any weekend, the spring pool at Pawod was teeming with kids swimming and jumping from the surrounding cliffs and overhanging tree branches. This means only one thing – zero-viz. And zero-viz it was at the spring pool and down to the first couple of meters inside the chamber. We therefore scrapped the first plan of primary tie-off down the permanent line, in which stead, I laid a temporary line from open water down to the start of the white permanent line. This segment turned out to be the more difficult part of the dive for the team. Jaime commented to Andy that it was no problem getting in at all – “just like in the pool”. Yes, the team spent nights in Doc’s swimming pool doing line following, reel exercises and emergencies. REDESIGN OF HINATUAN’S ENCHANTED RIVER UNDERWATER CAVE SYSTEM – A NATURAL CAVE IN?